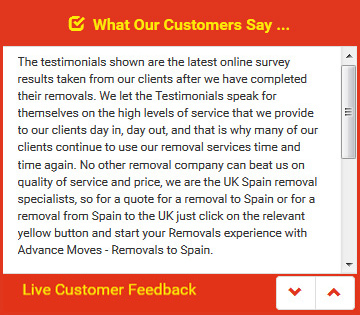 Spain UK removals or UK to Spain moves are equally as exciting. People journeying to new countries to experience new cultures is inspiring for them, their friends and families. It won�t just be you moving to a new home, however � you may also be taking your furniture too. If you do choose to carry out your removals to Spain or the UK with your furniture in tow, it is essential that you measure it accurately before going to the expense of removing it. Otherwise, you may have to pay again for additional storage at either end. Take a tape measure with you when you go to view you new home, and measure the spaces that you intend to place your furniture. It is no use having the measurements of the furniture pieces themselves without knowing how large or small the spaces are that you want them to go into. It could be that your bed is simply not going to fit, for example. Knowing this information before the day of the removals from Spain to UK, or vice versa, means that you can organise the sale, storage or disposal of your old bed, and arrange to buy a new one in Spain. Measuring doorways to ensure your furniture will fit through is always going to be a good idea as well, and is something that, in the rush and the excitement, could easily be forgotten. If you are unable to view the property before the move, then your estate agent or lettings agent should be able to provide the information you need. Whether you are considering Spain UK removals or UK Spain removals, contact Advance Moves. We will have an option that suits you from our range of services. Find a quick quote on our website at http://www.advancemoves.com/ or contact us on 0871 218 0612 or info@advancemoves.com for more information.